Hypertrophic scars are thick, elevated and red in appearance and may be associated with pain, burning, itching and sensations of tightness or pulling. They are quite often mistaken for keloids but are usually far easier to treat and associated with a better long term prognosis. Their footprint is limited to the original injury or incision as opposed to keloids which extend beyond the original wound. Hypertrophic scars can form after many types of surgical procedures such as in the vertical incisions used for abdominal surgery or the incision used for open heart surgery overlying the sternum. They are also commonly seen after skin injuries particularly those that did not receive medical care and healed on their own. The treatment of hypertrophic scars varies depending on multiple factors including size, width, configuration, location and etiology. It may as simple as the application of a scar reducing agent such as silicone gel or Mederma® or the usage of silicone gel sheeting. 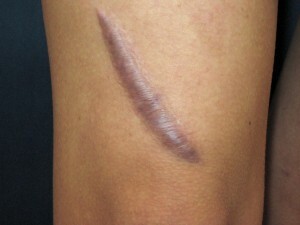 The surgical treatment, known as a scar revision, can involve the excision of the scar and one or more of a variety of plastic surgery techniques that require very meticulous and precise closure along with appropriate postoperative care. More complex procedures that involve local rearrangement of tissue (flap) in order to help reduce the risk of recurrence may be needed in certain situations. The precise injection of a steroid into the hypertrophic scar, on one or more occasions over time, can be an effective non-surgical treatment that results in a flat scar. However, there is often some scar widening as well as thinning and depigmentation of the skin. This can also be used as an adjunct with the surgical approach. A variety of lasers have also been suggested as a method of treatment but as of yet, there is no compelling evidence to make their usage a front line treatment (read blog: Are Lasers an Effective Treatment Option for Hypertophic Scars? ).